The bread and butter of an alpaca farm is a strong white and light program to enhance a white OR a colored breeding program and in order to achieve that you need a light male so exceptional that he can improve on, and produce in his offspring, the finest fleece that a huacaya can possess... and insert those qualities in a white OR colored breeding program. You need that balance of fineness, density, and crimp that produces the best fleece qualities for todays extremely competitive market. Bandimere’s sire is Brilliance of Peru (owned by Golden Spirit Alpaca Ranch) a crimpy, bright and fine fleeced male whose fleece will make you go AWWWWW. Bandimere is a head turner whose achievements in the ring prove he is one of the greats in the industry. He has won 2 color and 3 reserve-championships and 7 blue ribbons. 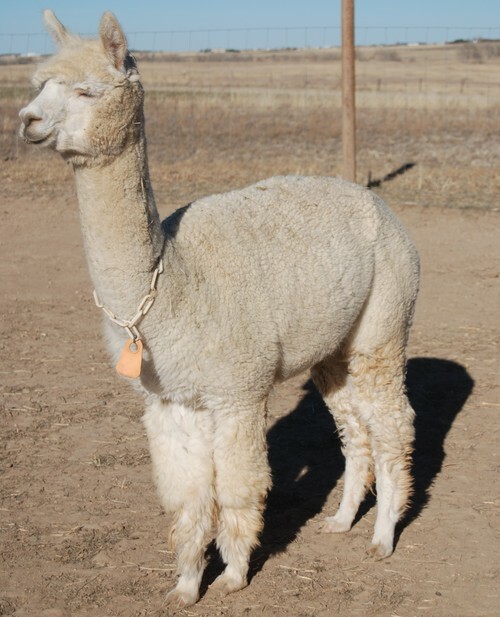 He is the sire of the strongest whites Mile High Alpacas produced for their show string including blue ribbon winners Mile High Lady Antebellum and Mile High Centurion. His light fawn male, Mile High Bandimere’s Murano, is leading their fawn crop in blue ribbons . He is also the sire of Mile High Bandimere’s Daytona, a dark brown male who now resides at Snowmass Alpacas. If you want a white male that has the scope to build on your white or colored program, Bandimere is it. Even for breeders that have the best of white females, Bandimere’s quality is all encompassing. This male is the total package and he is able to improve the offspring of any female of any color. White and beige alpacas are a force unto themselves, and we believe this guy is one of the best out there. The name "Pica Flor" is spanish for hummingbird. Pica Flor is a midnight beauty and one of the backbones of our dark-colored program. She has a typey build and true Peruvian head with an intelligent eye. Pica has proven herself to be more than just a foundation female. She is of such high caliber that even when experimenting with lighter colored genetics we were guaranteed a high quality offspring. When bred to colored males Pica Flor has unfailingly produced dark colored crias ranging from chocolate to ebony. But beyond going dark, she goes first class. She has combined quality with dark genetics and delivered us champions such as Mile High Ave Maria and Mile High Midnight Rhapsody. And when we did push the envelope and bred her to our fawn herdsire Mile High Peerless Bay we received Mile High Evita, a light fawn female that could hold her own against the whites. We were so pleased with Evita that we decided to experiment once more. We bred Pica to our highest award winning fawn herdsire, Mile High Peruvian Tahona. As a 3-time color champion, and 11-time blue ribbon winner the designation “Elite” is stamped on this male. He has the characteristics that will assist Pica in producing a beautiful cria. This cria will be due in September 2013. If it’s fawn it will be a knockout, if it’s black it will be something sensational. This female is a needed addition to any dark-colored program. Pica Flor is not just a consistent producer of dark offspring, but is a bearer of true colored champions. Her reservoir of quality acts as a fail-safe for those breedings that push the envelope in trying to mix the best of fiber genetics with dark coloring. And with the cria she carries, she is the black gold among dark alpacas. 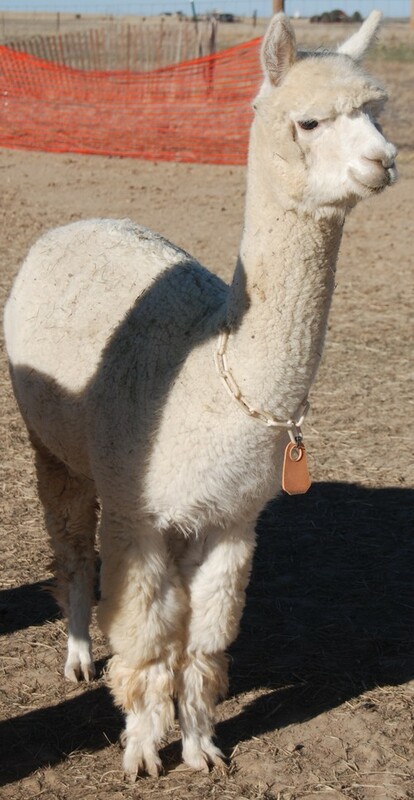 Emillianna is a prime example of an alpaca you would expect to emerge from the Mile High Alpaca Breeding program. The choice to integrate Brilliance of Peru genetics through his excellent son, Mile High Bandimere with Starry Night's Pica Flor was brilliant and Emilianna is result. 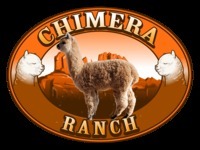 Chimera Ranch was able to acquire Emilianna as part of a package from a farm that was going out of business. Given that our breeding program is not focused on light/white, we are pleased to offer her for sale. You will not find a better genetic package for such a great price.